Despite the fact that Google’s Android mobile OS comes with loads of features, many of you will probably want to root, hack/mod it as much as possible. This cannot be achieved without enabling USB Debugging mode, which can be found under Developer options. Since Android 4.2, Google has made the Developer Options menu hidden. 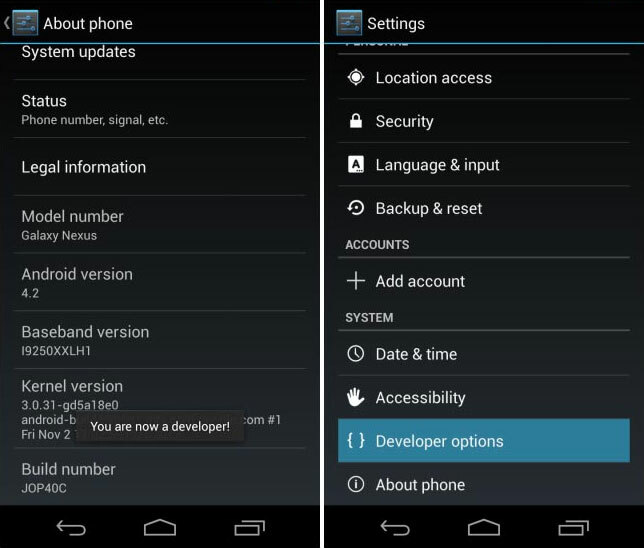 In this guide we’ll show you how to enable developer options in Android 4.3/4.2 or later. First of all you need to go to ‘Settings’. Now scroll all the way down to the bottom and tap on the ‘Phone’. Now scroll down to the section that reads ‘build number’. Now repeatedly tap on Build Number until a prompt appears that reads: “you are now a developers!” (7 taps should do the trick). You’ve successfully enabled developer options on your Android phone/tablet. You can access Developer Options menu under Settings app. I think Google decided to hide developer options because an average user has nothing to do with them and may inadvertently mess with the functions and settings meant just for developers. I wrote this guide for those who perhaps gave up having found no clear instructions on activating developer options. If you’re indeed running Android 4.3, 4.2 or later and used these instructions to enable developer options on your phone or tablet, be sure to share your experience in the comments section below. This entry was posted in How to and tagged Android 4.3, Android Jelly bean on September 1, 2013 by Adnan Ashraf.